While the Internet has enabled the sharing of information and opinions in ways that previous generations could only dreamed of, it has also generated new ways for false information and deliberate lies to spread widely that form misconceptions. False anti-vaccination information is on the rise and anti-vaccine websites have proliferated. Despite continuous efforts at correcting the false information, misconceptions still linger in the public discourse and anti-vaccine information still gets shared through social media. 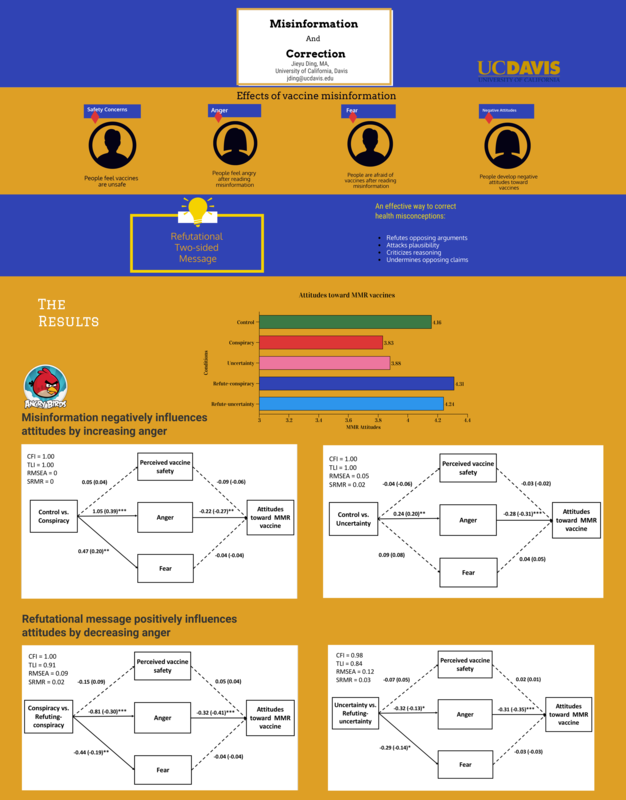 Previous research has examined the popular frames used in anti-vaccine messages and it is important to study the effects of different frames on influencing people's attitude and behavior intention towards vaccination after exposure. The results of the study will inform health professionals, media, and the government of ways to correct people's information processing and understandings of vaccines. We employ an online experiment to compare the effects of different frames and formats of presenting and refuting vaccine misinformation on people's attitudes and intentions toward vaccines. ​Jolley D. & Douglas K.M. (2014). The effects of anti-vaccine conspiracy theories on vaccination intentions. PLOS ONE, 9.